Steve Lowery is vice president and director of sales, and Lloyd Hundley is laboratory director, Tower Oil & Technology Co., Chicago, IL; www.toweroil.com. 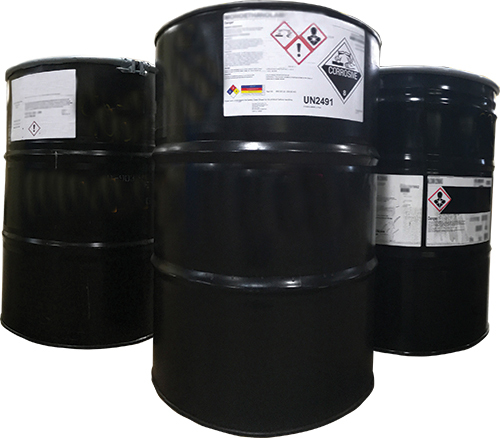 On June 1, 2015, manufacturers and distributors of chemicals (including stamping and machining lubricants) were required to use the Globally Harmonized System (GHS) for classifying and labeling. One year later, metalworking companies and their employees were required to employ the GHS system, encompassing a range of products including stamping lubricants, machining and grinding coolants, rust preventatives and cleaners. OSHA requires an understanding of the GHS hazard-classification system by all personnel in contact with workplace chemicals, including stamping lubricants. Of the nine pictograms OSHA has adopted, which find use worldwide, most metalformers will use only four (three shown here). Along with the pictograms, warning labels will include an accompanying signal word—“Warning” for less severe hazards, or “Danger” for the more severe hazards. While this may sound daunting, with the knowledge and understanding of how this pertains to your company, it is easily completed. In the past, chemical manufacturers, distributors and importers provided Material Safety Data Sheets (MSDS) for their products. However, the MSDS format and general content, which included some required information, often varied considerably among chemical manufacturers. This caused confusion and a lack of symmetry within the industry. The new SDS format—used internationally—is straightforward and very effective in communicating the hazards of chemicals used by manufacturers. The move to the 16-part SDS format provides for a consistent, uniform procedure that allows employees to quickly identify key chemical characteristics, regardless of the supplier. An exclamation point indicates lubricants and other chemicals that include irritants (skin and eye), skin sensitizers, acute toxicity agents (harmful), narcotic effects, respiratory-tract irritants, or are hazardous to the ozone layer. 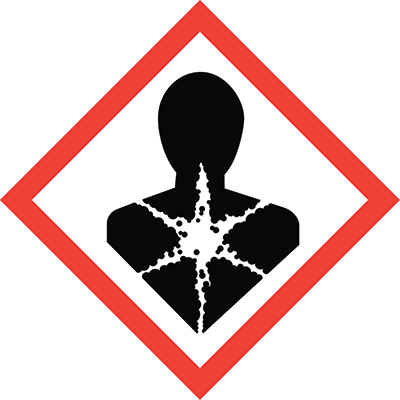 The exploding-heart pictogram on packaging indicates health hazards such as chemicals that may be carcinogenic, cause mutagenicity and/or reproductive toxicity, are respiratory sensitizers, or cause target organ toxicity and/or aspiration toxicity. 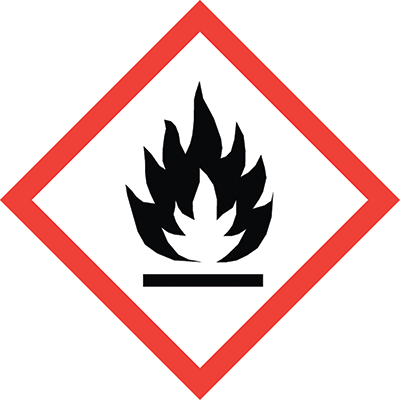 Chemicals that are flammable, self-heating or self-reactive, or organic peroxides, are identified with this flame pictogram. 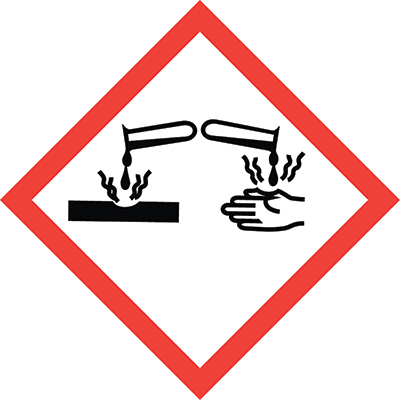 The corrosion pictogram identifies chemicals that may cause skin corrosion or burns, eye damage, or are corrosive to metals. 16) Other information—Date of preparation or revision and other useful information. While all sections of the SDS are important to understand, the one that is new for the GHS SDS format is Section 2—Hazard Identification. The use of the previously required Hazardous Materials Identification System (HMIS) has been replaced by GHS hazard classification, signal words, and pictograms. The GHS does not require the use of HMIS ratings, which ranked chemical from 0 (safe) to 4 (most hazardous). That system conflicted with other ranking systems used internationally, where a 4 rating represented a safe chemical and a 0 rating indicated a chemical as hazardous. While some chemical manufacturers still include this information in their SDS, it can be confusing to use both systems. Exclamation point—Irritants (skin and eye), skin sensitizers, acute toxicity agents (harmful), have narcotic effects, respiratory-tract irritants, or are hazardous to the ozone layer. Exploding heart—Health hazards, such as chemicals that may be carcinogenic, cause mutagenicity and/or reproductive toxicity, are respiratory sensitizers, or cause target organ toxicity and/or aspiration toxicity. Flame—Chemicals that are flammable, self-heating or self- reactive, or organic peroxides. Corrosion pictograms —Chemicals that may cause skin corrosion or burns, eye damage, or are corrosive to metals. Along with the pictograms, warning labels will include an accompanying signal word—“Warning” for less severe hazards, or “Danger” for the more severe hazards. The intent is to alert the user to potential hazards listed on the label, and the severity of the hazard. Metalforming-plant personnel, by reviewing the pictograms and signal words accompanying their lubricant packages, then can review the appropriate hazard and precautionary statements, which detail the nature of the chemical’s hazards. “May cause an allergic skin reaction” is a frequently used example. A detailed understanding of all four parts of a chemical’s SDS is key to ensuring worker safety and proper use of the chemical. For a more detailed explanation, review the chemical’s full SDS. A good source for additional information is the online OHSA Briefs: www.osha.gov/Publications/ OSHA3514.html. Through the years, lubricant suppliers have continued to innovate, using newly developed additives for a variety of purposes, including to enhance worker safety. Among the thousands of additives available to lubricant manufacturers, many are safe to use while others may require warning labels on the lubricant packaging. If some of the chemicals in your plant have such warning labels, find out why. Also be sure to understand usage restraints, methods or means of overexposure, and how to minimize these risks with proper use and controls. Consult with your lubricant supplier as to the warnings or dangers related to their products—there may be alternative products that are safer to use while still performing the needed functions. There are many “tried and true” lubricants that have been used for many years. And, additive technology has evolved in recent years, as have health and safety standards and classification systems. With the pace of innovation and change within the lubricant industry, if you have been performing operations or tasks the same way for the last several years, chances are there are better ways. Years ago, petroleum-based soluble oils were the norm in stamping plants. While performance in the tooling was excellent, some negative downstream effects resulted. For example, oily parts often were sent to welding operations, which created smoke and poor weld quality. And, increased cleaning costs associated with soluble oils, as well as part quality, could increase post-processing costs. With the introduction of modern synthetic forming lubricants, parts can move directly from stamping to welding, creating better weld quality, minimal to no smoke and a safer environment for operators. Additionally, with synthetic technology, parts are easier to clean and do not require as much heat or chemicals to process, reducing overall operation costs. Solvent-based lubricants are used to produce clean, dry parts after stamping. The typical lubricant carrier is a petroleum distillate, such as mineral spirits, naphtha or similar petroleum derivatives. A variety of lubricity additives are blended with the carrier to develop the lubricant. 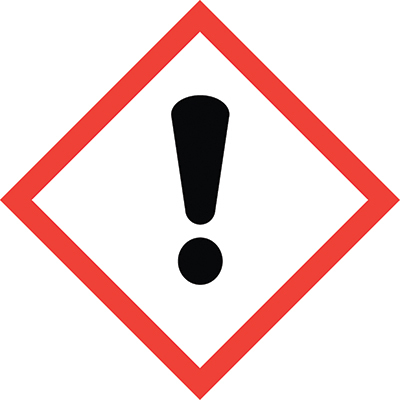 The hazard and health warnings placed on these lubricants can be a bit scary, especially when labeled with an exclamation-point pictogram (skin and eye irritant), a health-hazard pictogram (for aspiration and inhalation hazards) or a flammable-liquid pictogram (for flash point and fire hazards). While many of the warnings and hazards are for overexposure, stampers should consider the alternatives available that may suit their needs and be safer for workers and the environment. For example, green-fluid technology offers a variety of advantages over existing products in this category. These lubricants offer safe, environmentally responsible solutions that often can replace solvent-based lubricants. For this new lubricant-labeling system to be effective, all U.S. employers and employees using chemicals in the workplace must become familiar with and understand its pictograms and signal words. Read the hazard and precautionary statements of all of the chemicals used in your facilities. Additionally, employers and employees no longer should accept dangerous chemical products from their suppliers. There are safer alternatives available.